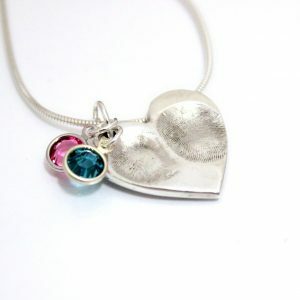 I have been asked a few times if the fingerprints captured on to the silver fingerprint jewellery are real and those of their loved ones……. they are! I think sometimes people are under the impression that they may be ‘my’ fingerprints or perhaps just a representation of a fingerprint. 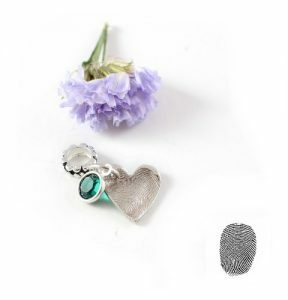 So, I thought I would spend 5 mins to explain how your fingerprints are captured on to the fingerprint jewellery and how they are then transferred onto the surface of the silver. Fingerprints are captured in 2 ways; a putty I post to you or directly into the silver clay if you live close by to Impressions to Keep. The putty is the most common way. It is easy peasy to take the prints, fingers are pressed into the putty, the putty dries and then posted back to me. I now have YOUR fingerprints. I will make a reverse mold of the print and rather than use the actual finger – rather difficult to send that through the post ….. I press the reverse mold into the silver clay. And then a beautiful keepsake is born and you have stunning jewellery with your actual fingerprints pressed on to the surface of the silver. 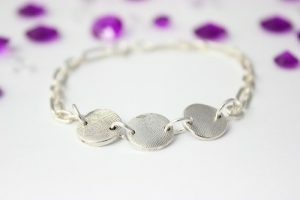 There are lots of different ways to wear your silver fingerprint jewellery, So many shapes and designs to choose from that there is something for everybody.